Creating Facebook ads can be a really effective way to get the word out to your community about your events. Ads can be especially effective if you are using Facebook pixel ID. Learn how to set that up here. Step 1. If you don't already have one, set up a Facebook business account for your organization or campaign. Get started here. Step 2. Launch your Facebook business page. Click the main menu in the left corner next to the Facebook icon. 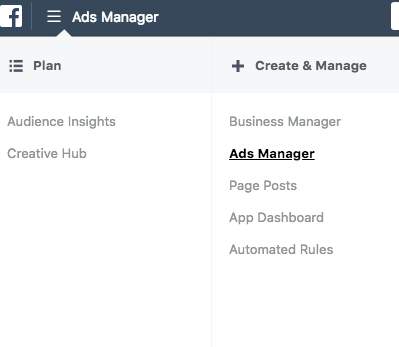 Select Ads Manager under "Create & Manage." Step 3. Select the green +create button to create your ad. Facebook will prompt you to select an objective for your ad campaign. You'll fill this out even if you only want to create a single ad, but if you make more ads later with the same objective, you will be able to apply the same settings and audience preferences. After you have named your campaign, hit continue. Step 4: Give your ad set a title so you can save and re-apply your preferences. "Ad Set" refers to your audience, budget, schedule, and bidding preferences. You can customize your audience by basic categories such as location, age, gender, and language. You can also customize according to specific interests (pages the user has liked), demographics (relationship status, education, type of work etc), or behaviors (frequent mobile user, frequent donor etc.). 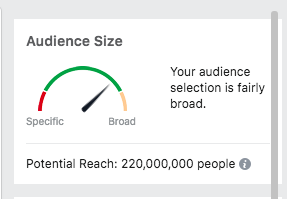 Once you decide who your target customer is, make sure to look at the Facebook needle on the right to make sure your audience isn't too broad or too specific. If you are using Facebook Pixel ID (highly recommended, get started here) you can select categories such as "has viewed my page" under "custom audiences." Step 5. Set your budget and customize your ad schedule. It is important to note that Facebook will not automatically spend all of your budget. Facebook ads are priced per audience interaction, so if users aren't engaging very much with your post, you won't be charged for your entire budget. Step 6. On the next page you can customize the content of your advertisement. In order to publish ads with political content you need to confirm your identity. Click here to read more about what qualifies as political content. Step 7. Launch your ad and start reaching viewers!